This week's theme is about sharing a Christmas story. My most impressionable memory which carries lots of nostalgia for me is putting up the tree with my Sister every year. We had a small artificial tree we hauled out of the basement. The same Christmas album would be played which began with the song "It's the Most Wonderful Time of the Year." To this day the song brings me right back to that moment when the needle hit the vinyl and the ornaments came out of the box. I always had to dance around for a few verses too, of course! And well, this brings us to the shopping season as we head toward that special day. Antiques are great alternatives to the same ol same ol stuff found in department stores? They carry lots of nostalgia too which is why I love them! 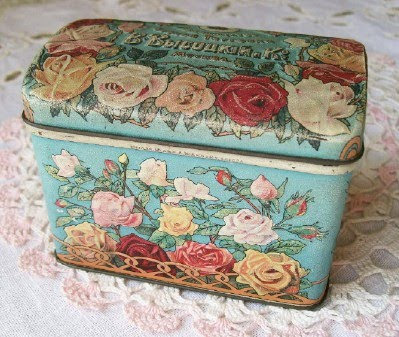 A sweet little Russian tea tin.... aqua with pink roses? Made my heart go pitter patter! 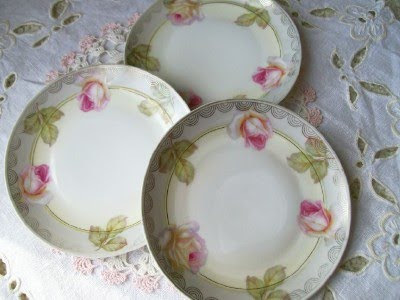 The roses in these plates are done so well...they seem to pop off the plates. I would arrange these on a wall in a set of three... but I have a total of six of them available for a bigger display. And an older style clasp on the back of this bar pin.... put it on your coat, market bag or denim jacket for some added splash! 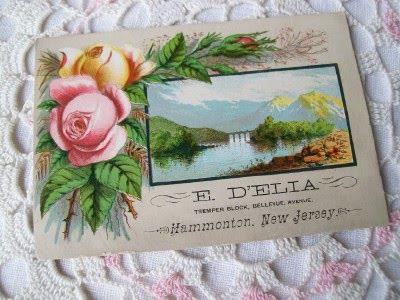 Advertising cards are great collectibles... especially when they have pink roses on them! 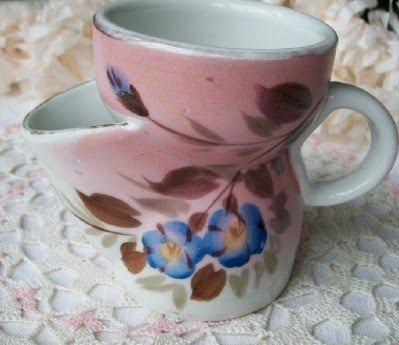 And an old pink shaving mug. Guess the fella who used this was "OK" with a pink one. 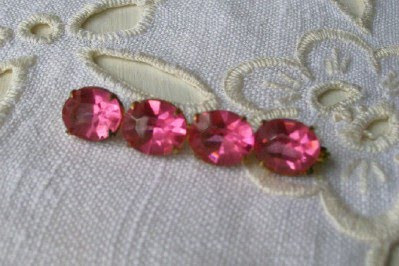 Pink glass bead garland...always a classic! 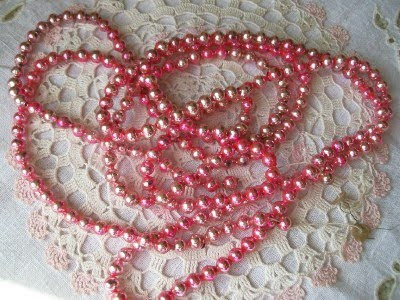 For more lovelies in PINK, check out Beverly's blog at How Sweet the Sound. Pretty antiques. Love that old tin. Pink Blessings! Beautiful treasures! 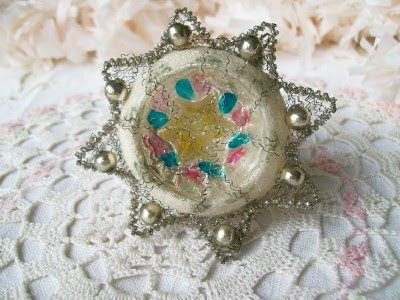 I love old chrissy ornaments too, have sold a few off this year though as have too many! I love "The Most Wonderful Time of the Year" it always makes me happy! Happy Pink Saturday! You've chosen some lovely pinks, with an air of nostalgia about them, to share with us today. I hope you are having a great day and looking forward to the holiday. I still get excited to decorate. I can imagine you twirling to the Christmas music. We still have our old albums. Your new goodies are so pretty. I especially love the bar pin. You always have the prettiest of the pretties. What a pretty post, Jillian! Enjoyed reading this and looking at all of your goodies!